Karen is an experienced actress with a broad experience in corporate business (as a headhunter, manager, coach). Her acting style is resourceful and natural, which she draws from her great sensibility. In 2017 she won a Best Actress Award at the Madrid International Film Festival. Since 2014 she runs film/TV production company DutchCheez Productions. 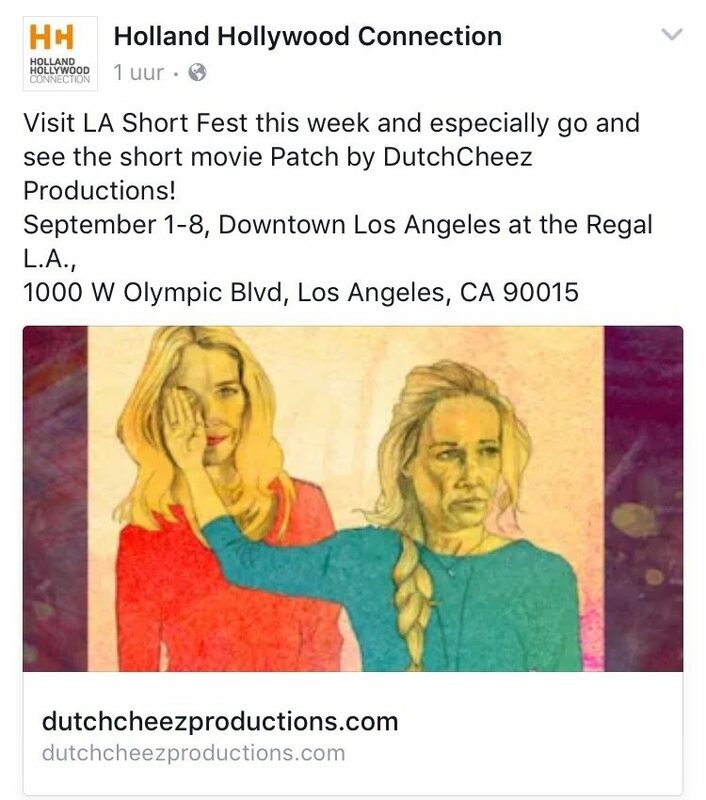 Her debut movie ‘Patch’ (2016), a short black comedy, has won four awards at the Best Shorts Festival (La Jolla/San Diego); two Awards of Excellence and two Awards of Merit with Special Mention. 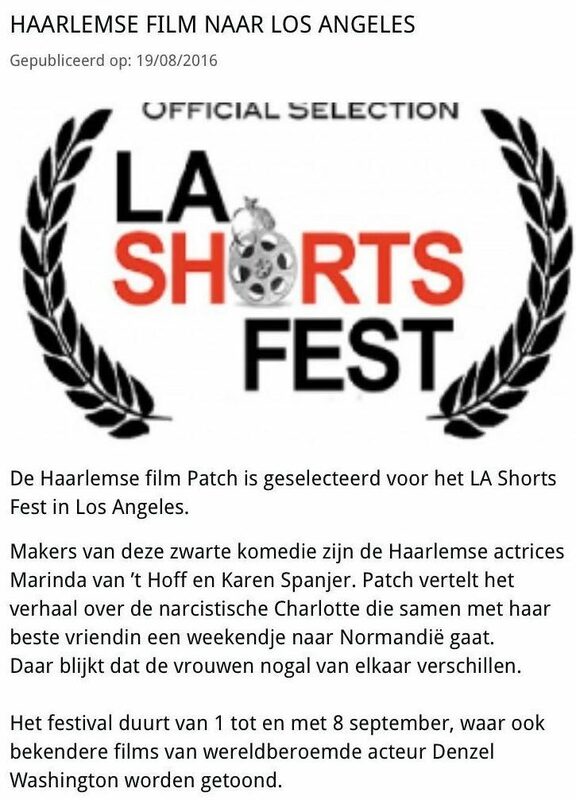 The film was also selected for the prestigious LA Shorts Fest, where ‘Patch’ had its premiere. 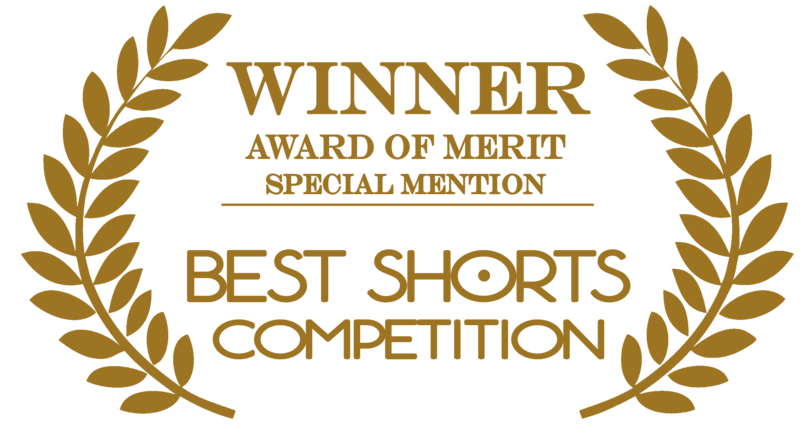 It has also recently won The Award of Merit at the LA Global Shorts Festival. In this film Karen is starring in a main role. 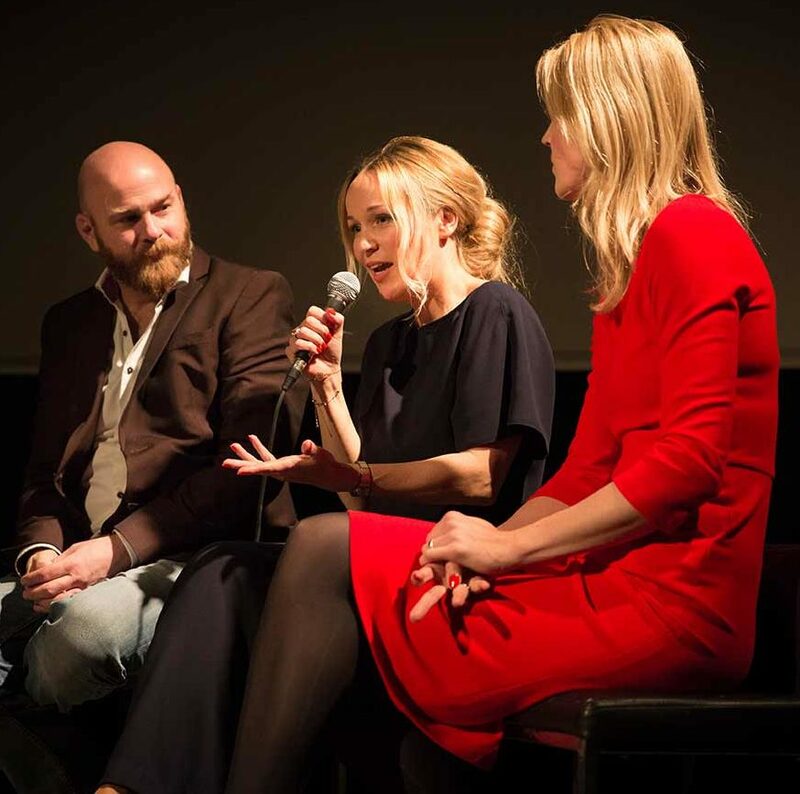 Currently, DutchCheez is developing a comedy series in which Karen will star in a main role. Karen has featured in various commercials, TV programs and short films. She is a frequently asked corporate actress and model. She is mother of three, married, fluent in French and English. 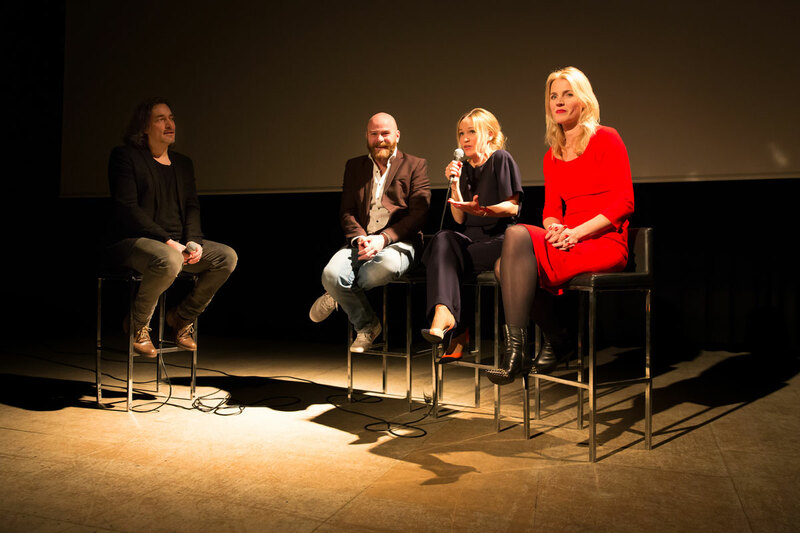 She is living in Haarlem and well connected in the Amsterdam film making industry. Karen works as an actress and producer. 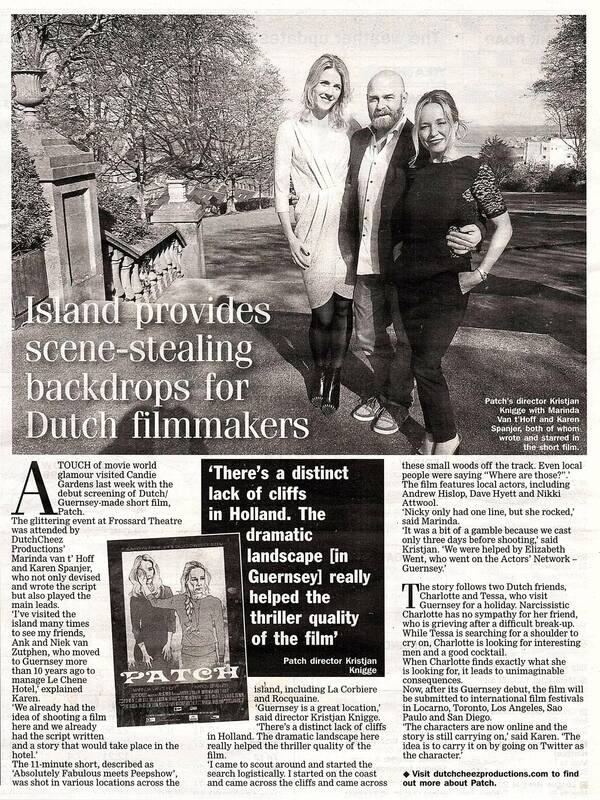 She independently produced an international short film called Patch that was shot in Guernsey/UK in which she starred in a main role. This film is purchased by international TV channel Shorts TV and is broadcast worldwide. She received a Best Actress Award at the Madrid international Film Festival 2017. 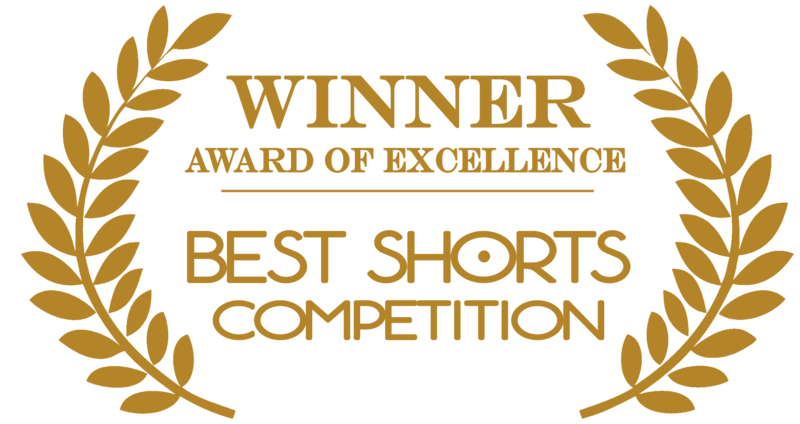 Patch was selected for the prestigious LA Shorts Fest and has won the Award of Excellence at the Best Shorts Festival (La Jolla/San Diego) and the Award of Merit at the LA Global Shorts Festival. Karen can also be seen in commercials like Lidl (as Willemijn with Beau van Erven Dorens), in Nuon and in NCOI campaigns. She appeared in commercials as Ikea, Belastingdienst, Caiway and Holland Casino and in several short films. Directors she has worked with: Kristjan Knigge (The Right Juice, Patch), Arno Dierickx (Overspel), Bram van Erkel (Het Twentsch Paradijs, Het Wassende Water) and Josja Hamann (drama coach GTST / Halina Reijn). 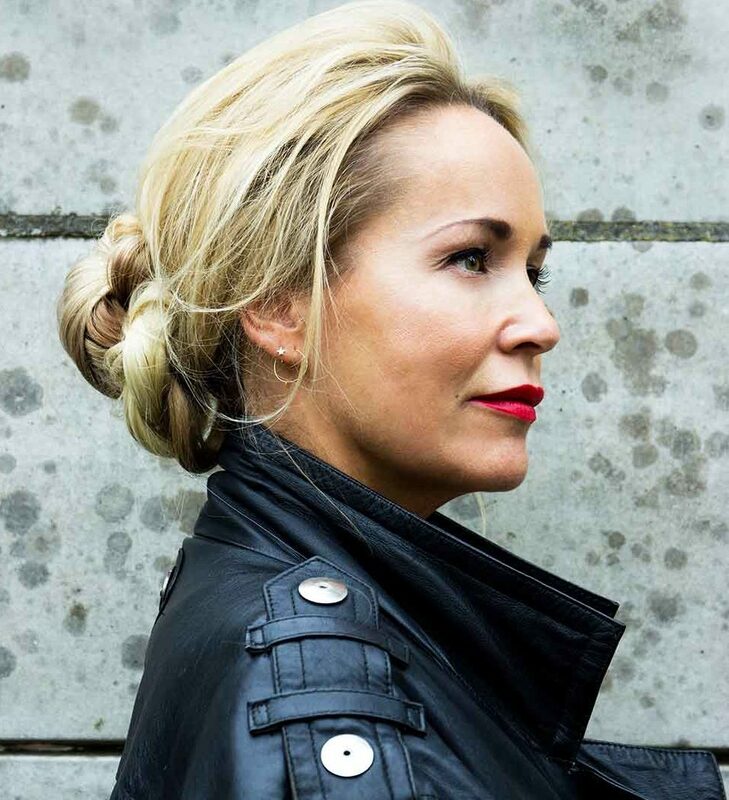 She appeared in television shows (Beschuldigd, Lachen met Arne with Arne Toonen, De Nationale Soap Acteerwedstrijd with Jimmy Geduld and Antonie Kamerling). She also works as a corporate actress for various companies and multi nationals and she has a musical background. 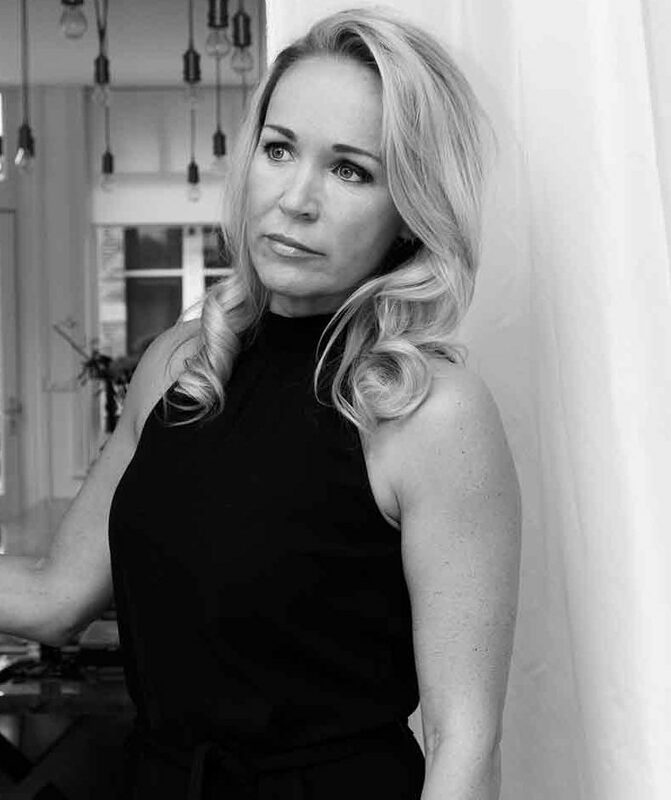 She was trained at the Camera Acting School Videcom Teledrama (Hilversum, The Netherlands) and at the School for Theatre and Television (Amsterdam, The Netherlands) by Josja Haman (former drama coach of GTST and Halina Reijn). Karen is frequently in London for acting training (at The Actors Centre and the Michael Checkov Studio), she joined Acting Masterclasses in Hollywood, London (Checkov, Meisner, Weston technique) and acting classes in Amsterdam at De Toneelmeester (Herman Bolten/Hugo Konings) and acting coaching (Sytske van der Ster). Karen speaks French and English fluently (she has a master degree in French Literature and lived 1,5 years in France, she also studied English as second language and frequently visited her father in the USA). Born (Twente) and raised in the province (Drente), she can manage well with a Drenthe/Twente accent. She is also good with children and groups of young people (through experience in education and training); she loves their fantasy world and their honest way of thinking. 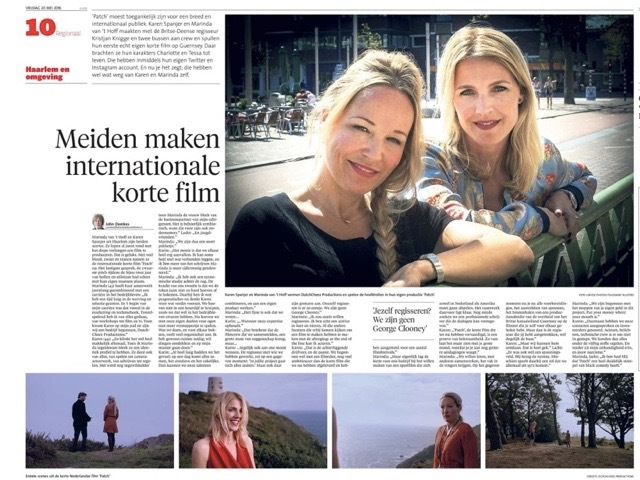 DUTCHCHEEZ is an independent INNOVATIVE film and media production company founded by Marinda van ’t Hoff and Karen Spanjer. 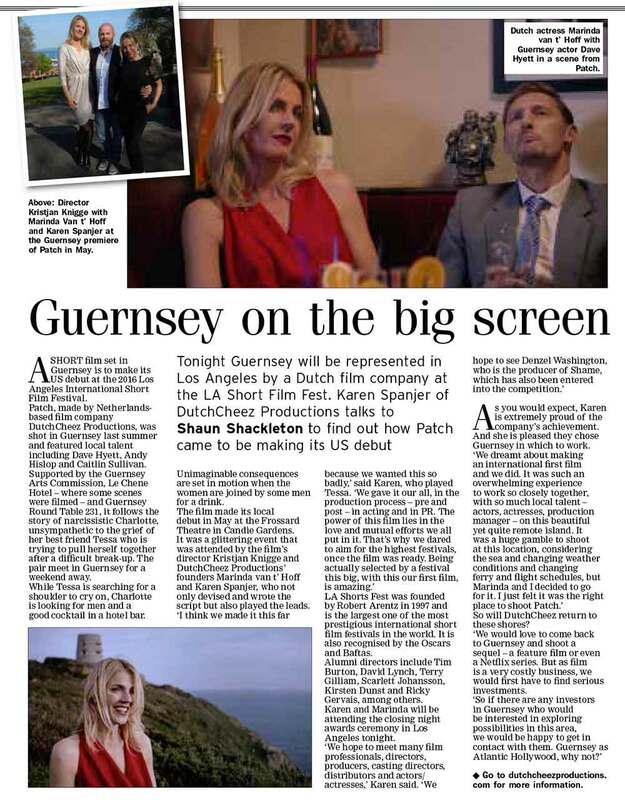 The black comedy “Patch” is their first production that was shot on the island of Guernsey (Channel Islands), starring Marinda and Karen in leading roles. This short film is a co production by DutchCheez and McG Media Productions and is directed by Danish/British director Kristjan Knigge. 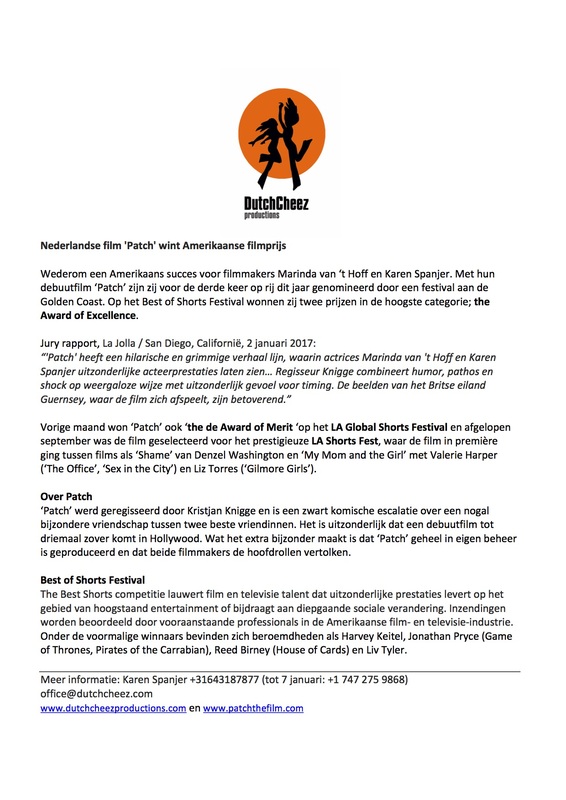 ‘Patch’ just won two Awards of Excellence and two Awards of Merit with Special Mention at the Best Shorts Festival (La Jolla/San Diego) and the Award of Merit at the LA Global Shorts Fest and the film was selected for the prestigious LA Shorts Fest where the film premiered last September beside Denzel Washington’s film ‘Shame’. 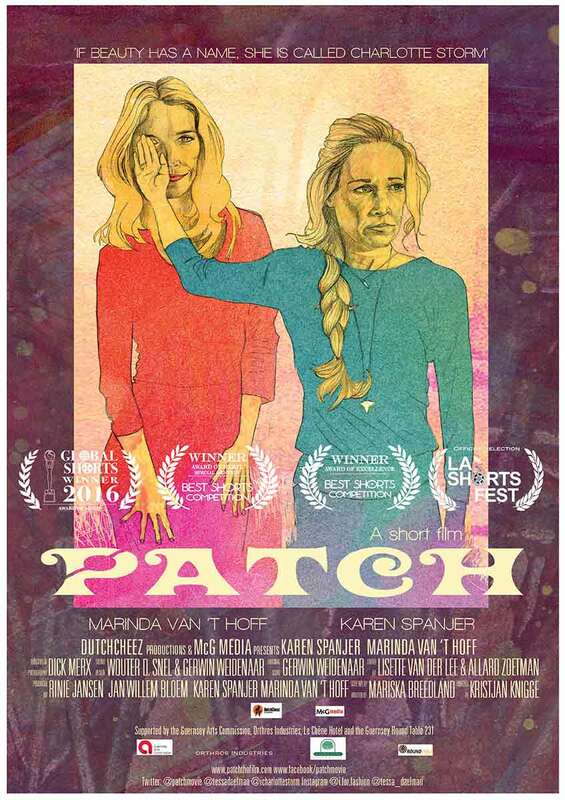 The film ‘Patch’ – which Karen produced and in which she plays a main role – won The Award of Excellence for Best Short Film and Humor and The Award of Merit with Special Mention for Script and Audience Impact. 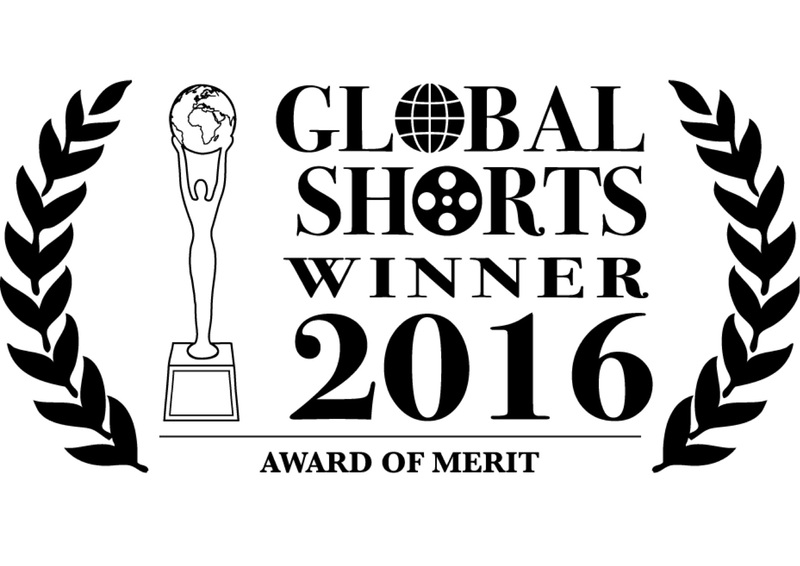 The film also received the Award of Merit at the LA Global Shorts Fest 2016. 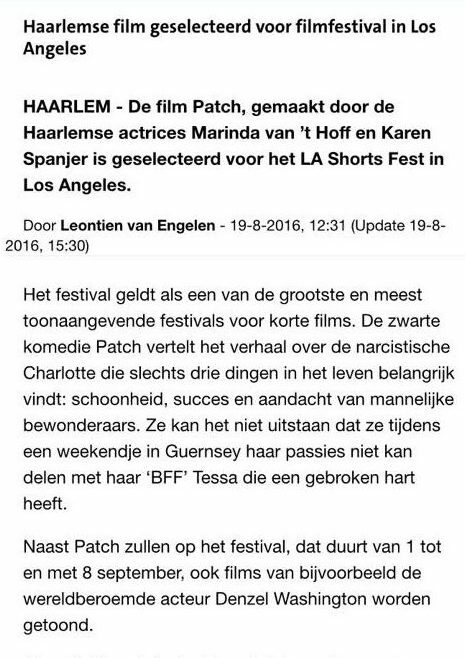 ‘Patch’ premiered at the prestigious Los Angeles Shorts Fest in September 2016.